Summary and Definition: The Apache tribe were a fierce, strong and war-like nation who roamed the arid desert lands of Arizona, New Mexico, and Texas. The Apache tribe fiercely resisted the invasion of the Spanish, the Mexicans and then the Americans. The names of the most famous war chiefs of the Apache tribe included Cochise, Geronimo and Victorio. What was the lifestyle and culture of the Apache tribe? The Apaches were a nomadic tribe of hunter gatherers. Men were in charge of hunting for food and protecting the camp and the women were in charge of the home. 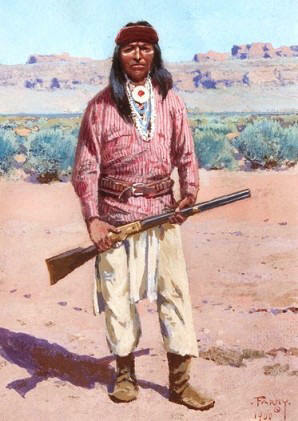 The name 'Apache' came from the Zuni word 'apachu' meaning "enemy". The Apaches formerly roamed over southeastern Arizona and south-western Mexico. The Apaches were extremely strong and fit and it was said that a warrior could run a hundred miles in a day or climb a high mountain and not be out of breath. Where did the Apache tribe live? The Apache are people of the Southwest Native American cultural group. The location of their tribal homelands are shown on the map. The geography of the region in which they lived dictated the lifestyle and culture of the Apache tribe. What did the Apache tribe live in? The Apaches were a nomadic tribe who lived in brush shelters or wickiups that were used for sleeping. A wickiup is cone-shaped and made of a wooden frame covered with branches, leaves, and grass (brush). The brush shelters, or wickiups, to enable them move quickly and without having to travel with cumbersome materials such as hides and wooden poles. What language did the Apache tribe speak? The members of Apache tribe spoke in the Southern Athabaskan (Apachean) language. What did the Apache tribe eat? The food that the Apache tribe ate depended on the natural resources of the area they roamed in. Small game, such as rabbit was a staple part of their diet together with corn, sheep and goats that they often traded with the farming Native Indians that lived in the Southwest. Other food items included beans, sunflower seeds and squash. The Apache tribe were a resourceful people and could subsist on herbs and roots. They were able to satisfy their thirst when traveling through the desert regions by chewing on a piece of bark or moss which started the flow of saliva. What weapons did the Apache tribe use? The weapons used by Apache tribe were originally bows and arrows, stone ball clubs, spears and knives. The rifle was added as their favored weapon with the advent of the white invaders. What clothes did the Apache men wear? The picture at the top of the page depicts the typical clothing worn by men. The clothes worn by the men always included breechcloths which were made from a long rectangular piece of animal skin or cloth which was worn between the legs and tucked over a belt. They also wore war shirts which were made of leather. Special, highly decorated aprons were worn over breechcloths and worn on special occasions. During the 1800's men started to wear cotton tunics with a leather belt fastened around the waist. They wore moccasins made of soft leather. A soft, light beige, slip-on shoe, consisting of a sole and sides made of one piece of leather. The traditional headdress worn by the Apache were simple cloth or leather headbands. What clothes did the Apache women wear? The type of clothes worn by the women of the Apache Tribe were simple and consisted of cotton calico dresses or blouses and skirts. The women kept their hair long that they usually braided. On special occasions their braids were decorated with bright strips of cloth and shells. Like all women they liked jewelry and wore turquoise and bead choker necklaces. What was the religion and beliefs of the Apache tribe? The religion and beliefs of the Apache tribe was based on Animism that encompassed the spiritual or religious idea that the universe and all natural objects animals, plants, trees, rivers, mountains rocks etc have souls or spirits. The Gila Monster was important and its symbol was to signify preservation and survival. The Apache tribe believed that its breath could kill a man. What were the divisions of the Apache tribe? The Apache tribe lived in extended family groups. 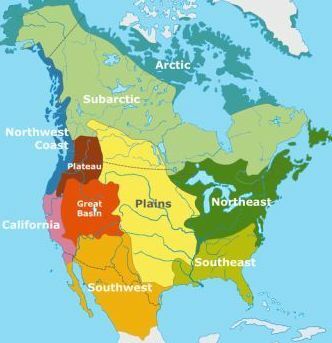 The major tribes were the Chiricahua, Jicarillo, Lipan, Mescalero and Western Apache. The bands of the Apache tribe were divided into the Arivaipa, Chiricahua, Coyotero, Faraone Gileno, Llanero, Mescalero, Mimbreno, Mogollon, Naisha, Tchikun and Tchishi bands. Who were the enemies of the Apache? Who were the most famous leaders and chiefs of the Apache tribe? The most famous leaders and chiefs of the Apache tribe included Mangas Coloradas, Cochise, Geronimo, Victorio, Natchez, Nantiatish, Chaffee and Ouray. Apache History: What happened to the Apache tribe? The Apaches fought long and hard but were eventually confined in reservations in Arizona, New Mexico and Oklahoma, including the San Carlos Reservation. The final surrender of the tribe took place in 1886, when the Chiricahua band were deported to Alabama and Florida where many were imprisoned in military establishments. For additional facts and information refer to the legend and the Story of Apaches.